Consensus building brand strategy workshops designed to help your brand(s) overcome specific marketing challenges and/or gain specific marketing advantages. 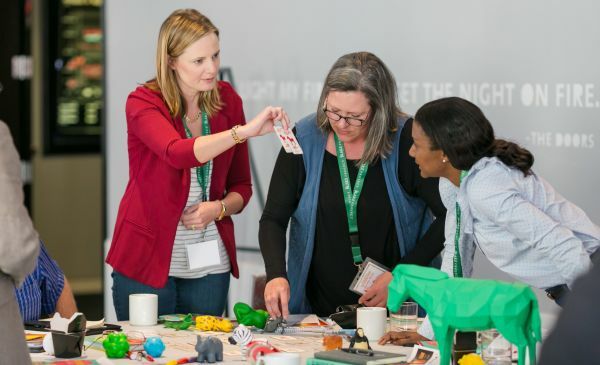 The Un-Conference: 360 Degrees of Brand Strategy for a Changing World — Limited to 50 participants and open to the public, this two-day, competitive-learning workshop is marketing’s only problem-solving event. Here, marketers from around the world compete and learn on teams, facing real world marketing challenges together. Competitive-Learning is about teamwork, openness to new ideas, strategy, creativity and fun. Everyone leaves with actionable tools and techniques for building stronger brands. This approach can also serve as the framework for a learning and development program within your organization. We offer a range of high impact workshops designed to achieve stakeholder consensus on issues or decisions that result in strategic advantage. Our process combines rigorous facilitation, educational components and brand management expertise to reach desired outcomes. In The Brand Positioning Workshop (one-day and two-day version), we work with you to develop your brand’s essence, promise, personality and archetype to achieve relevant differentiation and flexibility for future growth. We also offer Brand Architecture, Brand Growth Strategy, Disruptive Brand Strategy, Strategic Brand Storytelling, Brand Positioning Strategy Co-Creation, Inside-Out Branding, Content Strategy, Customer Experience Co-Creation, Customer Touch Point Design, Brand Strategy for Startups, Mission, Vision and Values, Brand Culture, Brand Values Alignment, Brand Voice, Brand Licensing, New Product/Brand Ideation and Emotional Connection Workshops. Thousands of marketers around the globe have benefited from our 1, 2 and 3 day brand education workshops. Each engagement is customized to meet your specific needs and learning objectives and each is delivered internally by one of our renowned marketing experts at your organization or location of choice. We have earned accolades from top executives, brand managers and marketing professionals by delivering actionable insights that really resonates – moving people to understand and react.